I haven't played enough of Black Ops II to render a real verdict on how I feel about as a game, I can say for sure that I really enjoy the soundtrack. It's a cut up from past games in the series, an exciting, diverse blend of whirling orchestral parts, ethnic instruments and atmospheric electronics. It shouldn't come as a huge surprise that the music is good—with the exception of Trent Reznor's main theme from the game, it was composed by Mass Effect composer Jack Wall. I emailed with Wall to ask him a bit about the soundtrack, and how he went about setting it apart from past games. Kotaku: Do you find that with a game like Call of Duty, it's tricky to create memorable melodies that won't get in the way of all the chaotic gunfire? Jack Wall: Not for this one. Dave Anthony and Jason Blundell, the lead writer/director and exec producer for the game, let me know early on that they wanted to create a more compelling single player campaign from the very beginning. We got away with more melody to help tell the story this time out. I just went for broader gestures over top of the gunfire when I needed to, but there is plenty of thematic material in the sections in between to forward the story for the player. Do you think that the whole "ethnic woman wailing dramatically" thing is getting overdone? Where did that come from, and why is it so popular? That would depend on the singer and how it's used. Azam Ali is unbelievable and I could listen to her from now until the end. I worked with Azam for the Pakistan level. She has that ethnic sound, but you can't really figure out exactly what ethnicity it is when she's singing. Of course she is Persian, but you hear Indian phrasing mixed with Israeli elements and other embellishments that makes it a little less about where and more about vibe and feel. In this level you're doing something rare in Call of Duty. You're spying and gathering intel for a significant period of time. I wanted to do something moody. It's some of my favorite music in the game. I hear Tabla in there - are there any other cool uncommon instruments in the soundtrack? I did use some tabla in Pakistan. There are 14 distinct levels in the game of which Pakistan is one. I tried to create a unique palette for each of the 14 levels. I designed several electronic percussion beds and sounds. My assistant Alex Hemlock and I spent a few days recording odd bits of sound from dumpsters, pipes, fences, and other sounds in the environment around my house and then mixed them with synths using pitch envelopes and various other effects to get a cool palette to start with. Additionally I worked with many solo instrumentalists and other voices to achieve the feeling of "a few take on the world" motif of the Call of Duty: Black Ops series. Most of the percussion you hear is real people playing real instruments. I might add synths or effects to those to create a certain futuristic feeling, but I like using the real thing as much as possible. When I'm playing a game, I want each level to feel like its own world that hasn't been repeated in the game yet. As you enter a new level, it should feel and sound different and fresh. To me it's not just about music, but what you are doing in the game and what it all looks like, and then how all of that works together. The music should help to make it feel like a distinct environment and give the player some new goodies to look at and to listen to and definitely something to feel. Black Ops II spans multiple decades - where did you go for inspiration when coming up with the general sound? Nino Precioso is a Nicaraguan lullaby that I reshaped to work as Raul Menendez' theme. It means "precious child". He is really the central character of the single player campaign and I just wanted to make sure that I hooked into him emotionally. The story surrounding him and his sister is really an important part of his character's motivation and I saw him as a 3-dimensional antagonist. He's not just a bad guy. He's had some bad things happen to him and his family. The music reflects that. Regarding the two very different time periods, I went for a more orchestral and acoustic palette for the ‘80s and a more futuristic palette in general for 2025. Some of the future levels are pristine and others grungy. The palette was further refined to reflect the vibe of the future levels. How is Call of Duty musically different from Mass Effect? Mass Effect is straight up sci-fi whereas Call of Duty: Black Ops II – even though a good chunk is set in the future – is more about reality or an extrapolation of what reality might be like in 2025. I think the visuals and level design influence the music and how you hear it as much as the music affects what you see in the game. The trick is to connect with the material you are writing for. Did you ever worry that this soundtrack would sound too Hollywood and too generic? What steps did you take to make it stand apart? I know that people criticize some orchestral music for being "too Hollywood". However, I love film scores and I think many are really effective at creating a certain mood for the story to nestle into. And no matter what, the orchestra is such an amazing tool for creating that sort of connection. The major difference between film music and game music is that you really have to fight with games to score some subtlety into the music. Everything is about action and pumping up the fight. But in order for that to feel real, you also have to find your moments to score some emotional support into the story. For Black Ops II, those moments were within the cinematics and the connective tissue in-between the fights. Nino Precioso is the best example. When you hear that in the game, it almost sounds like source music – like Raul is playing the guitar and singing to his sister. I used different versions of that motif in some of the action cues such as "Savimbi's Pride". I also used different tonalities of Nino Precioso in various cinematics and intro movies like the scene where "Guerra Precioso" ("precious war") plays when you get to the Command Center level in the USS Barack Obama. This represents Menendez' darker side and what that means for the story. To me story is everything. Any other interesting tidbits about making the soundtrack? Any small stories about writing it? Because of the production schedule, I wasn't able to even see most of the cinematics and level intro movies before I did my final recording sessions at London's Abbey Road this past August. So I wrote a bunch of thematic material for those sessions that I could later edit into those cinematics when they were ready in September. I recorded all of the various elements I thought I might need – hits, swells, effects and themes. Then I created a "cinematics library" and began editing them all into the final timed cinematics at the end. That ended up working really well and I think they tie the score together nicely through the campaign. Thanks, Jack, for taking the time. 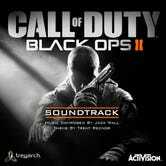 You can get the Black Ops II soundtrack on Amazon and on iTunes, among other places.